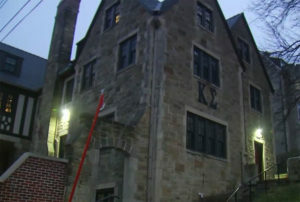 The University of Iowa is suspending four fraternities following an investigation of nine fraternities for incidents involving hazing and alcohol. The Kappa Sigma, Delta Chi, and Sigma Nu fraternity chapters, as well as the Sigma Alpha Epsilon are no longer to operate at the University of Iowa. The school announced the action in a news conference Thursday evening. The action comes after the conclusion of comprehensive investigations into incidents involving hazing and alcohol. The U-I banned alcohol at its fraternity and sorority events after 19-year-old student Kamil Jackowski was found dead at the formal for Sigma Chi at Lake of the Ozarks in 2017. University of Iowa Student Life Vice President Melissa Shivers told KCRG TV that Kappa Sigma’s international chapter was so upset about the hazing that they revoked their charter. “Usually when national chapters get involved, they understand the significance of the incidents and they want to make sure that they’re able to be responsive and continue to be in alignment with who they are,” Shivers said. The fraternities will not continue to operate as a recognized fraternity or a registered student organization. That means the school won’t recognize them and they won’t get funding other student organizations get. The university said this will affect about 400 students. Men can still live in the fraternity houses since they’re privately-owned. New pledges do get a chance to pledge elsewhere. The students have until January 11 to appeal the university’s decision.